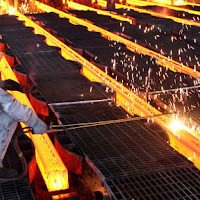 NEW DELHI: The government Friday said talks are underway with the US over 25 per cent tariff it has imposed on steel imports. Odisha has 700 mt of known bauxite reserves and has the potential to become the bauxite capital of the world. The state has 70 per cent of India's total bauxite reserves. The spread between cold-rolled coil and HDG base prices to hot-rolled coil narrowed, with the daily Platts TSI HRC assessment remaining unchanged from Friday at USD 821.50/st. The total production of colour coated coil and sheet will reach 4 lakh tonnes per annum once the two new factories come into production. Japan exported 1.7 million mt of steel to the US in 2017. JFE's share was 600,000 mt, or about 35% of all Japan's steel exports to the US.